Miller Municipal Supply, LLC, located in West Lawn, PA, can meet your sign and safety supply needs with our full line of Penn DOT, ADA, OSHA and custom signs for local boroughs, townships and cities as well as private developments, contractors and industry. Using our state-of-the-art Roland Plotter with Flex-i-sign software we can turn camera ready artwork into the sign of your choice. Miller Municipal is committed to Green business practices. An example is the unique way they can take old, faded signs and recycle them into a new, high intensity sign. 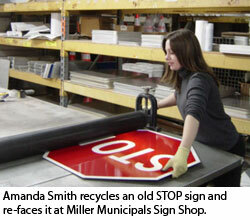 So there is no need to throw away old Stop signs or any other faded traffic sign because now they can be 100% recycled. We are an approved traffic sign manufacturer and distributor of highway construction supplies. Traffic control and speed control devices are also available. And we provide safety equipment to the road and highway industry as well as many types of smaller construction equipment. 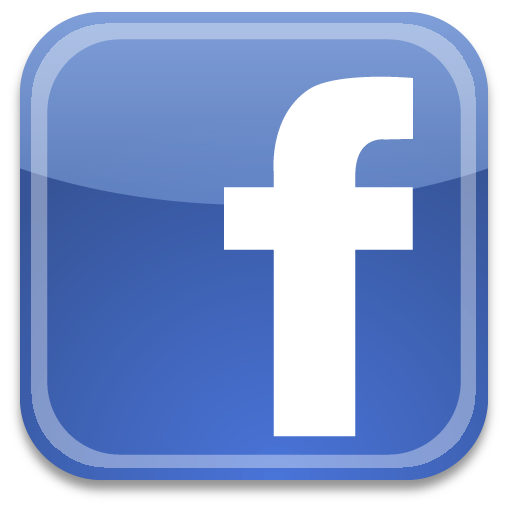 We have over 15 years of experience in the industry and a qualified staff to answer your signage questions. Many types of marking paint in many different colors are in stock and follow the Pennsylvania One Call color coding system. In addition to OSHA signs and custom signs, Miller Municipal Supply is equipped to satisfy your needs for engraved signs, and vehicle lettering. Miller also customizes cars and trucks with their expert detailing system. Many local Police departments use our expert detailers to replace or place new decals on their police cruisers and other emergency vehicles. 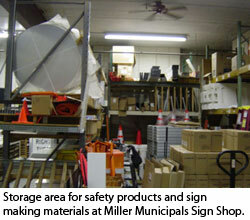 OSHA and custom signs are designed and manufactured at our facility. You can customize your wording and even add company logos to your sign so you no longer have to settle for the generic signs from mail order catalogs. Most commonly used items are in stock at our warehouse and can be promptly shipped to your location. If you need any assistance please contact Miller Municipals expert staff with the information provided below. © 2019 Miller Municipal Supply, LLC. All Rights Reserved.